Love’s Travel Stops (Love’s) store employees recently wrapped up a five-week campaign, raising $167,723.18 for Monroe Carell Jr. Children’s Hospital at Vanderbilt, the local CMN Hospital. More than 430 stores in 41 states participated in the national campaign that raised a record $2.7 million for CMN Hospitals. Since 1998, Love’s has raised more than $20 million for the nonprofit organization. 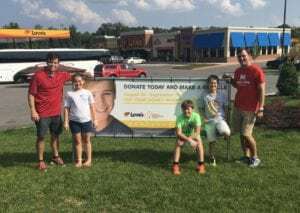 From August 26 through September 30, Love’s team members sold CMN Hospitals’ miracle balloons for donations and organized numerous fundraising events. In Middle Tennessee, the six stores hosted a golf tournament, a car show and raised funds through booths at local community events. Love’s showed additional support for Monroe Carell Jr. Children’s Hospital at Vanderbilt on National Coffee Day on September 29. In honor of the day, all 24-ounce hot beverages were discounted to one dollar, with all proceeds going to the hospital. Nationally, Love’s employees surpassed their goal of raising $2.6 million. On a local level, Love’s increased fundraising six percent over last year’s campaign total. CMN Hospitals open their doors to all kids, regardless of a family’s ability to pay. Member hospitals in the U.S. provide $3.4 billion in charity care annually. The funds raised at each Love’s location benefits sick and injured children in that community. Of the 170 CMN Hospitals’ members throughout North America, 101 benefit from Love’s annual campaign.